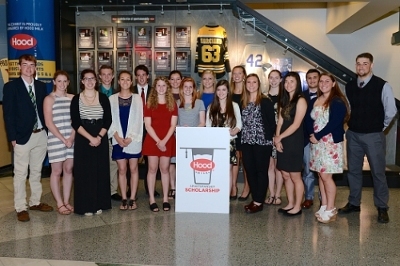 Kaileigh Davis of Newbury was one of 18 New England high school seniors from to receive a $5,000 Hood® Milk Sportsmanship Scholarship. Davis received her scholarship at a ceremony held at the TD Garden in Boston on Monday. Three high school seniors from each six New England states – Connecticut, Maine, Massachusetts, New Hampshire, Rhode Island and Vermont. Students were honored for their integrity and sportsmanship both on and off the playing field. All the students will be included in the Sportsmanship Exhibit inside The Sports Museum at the TD Garden – one of the only sportsmanship exhibits in the country. Davis will be attending The University of Rochester. This entry was posted in community, education, news, NH on May 17, 2016 by GrowingInArt.